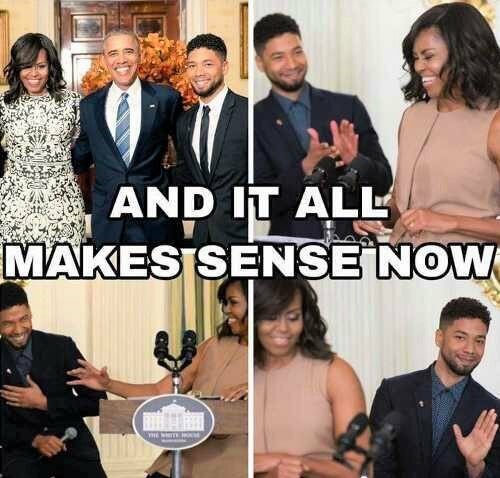 This, coupled with it's now come to light that George Soros donated $408,000 to the prosecutor - Kim Foxx - who let Smollett walk, makes this much clearer. The timing couldn't be more suspicious, either. The Word of the Day for today, boys and girls, is Ménage à trois - French for an arrangement in which three people have romantic and/or sexual relations with one other. Aint that cozy now? Well well well, something stinks. When Moochelle entered the saga, nothing more needed to be said. Thanks, everyone. Something's rotten in Chicago and I don't think it's the stockyards, either. Of course, cesspools of corruption always stink.